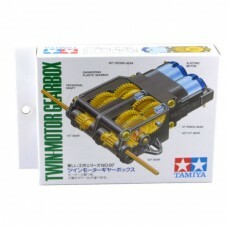 The Tamiya 70097 Twin Motor Gearbox is a fun educational kit that is also useful for small robotic projects. Two independent FA-130 brushed DC motors are included. These motors are designed to operate at 3V and we recommend replacing them with Pololu’s 130 sized motors for a more robust solution. Each motor provides 3mm hex output shaft for attaching compatible wheels such as the Tamiya truck wheels that we carry. This kit can be built to use one of two gear ratios: a fast 58:1 or a strong 203:1 gear ratio. We recommend using the strong 203.1 gear ratio for a higher torque that gives your robot more power. If you’ve never built a Tamiya kit before, then we feel this is a great kit to start with. Instructions are primarily picture driven and it does require some skill to assemble but it really is a lot of fun.